When you have someone that you’re in conflict with, you’re far better off finding common ground with that person and getting past the difficulty than you are letting the problem fester. There is no better way to eliminate an enemy than to make him or her into your friend. I’ve found that the most painful moments in my life have been the ones that have fueled me to improve my life. Use those low moments as fuel to do something great. I am a firm believer in the idea that you make your own luck. It takes work to build luck, of course, much as it takes work to build anything. Honesty is an interesting thing. This video made me think very deeply about what’s honest and what isn’t. Is it dishonest to send a text as you’re getting ready to leave that says “on my way”? Are you prepared for the next moment in your life to be the one that changes your life? The more prepared you are, the more likely you are to be able to take advantage of that magic moment. Sarah is one of the most vital pieces of my life. Her love is sustaining. 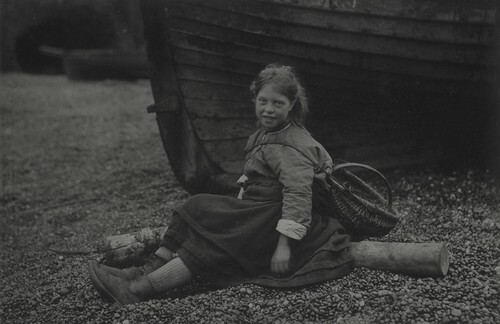 Here’s a photo of a happy girl sitting on the ground in Auchmithie in Scotland in 1881. Who was she? What was her life like? There is so much beauty in the world that we don’t even get the chance to see. This isn’t just good advice for building a good reputation. It’s good advice for being a better person. Act like the person you want to be for long enough and you’ll become the person you want to be. If you’ve never heard Sarah Vaughan sing, you owe it to yourself to listen. It is far better to securely have a few key things in life than to try for “everything” and find yourself constantly compromising.